The Business Improvement District Page! 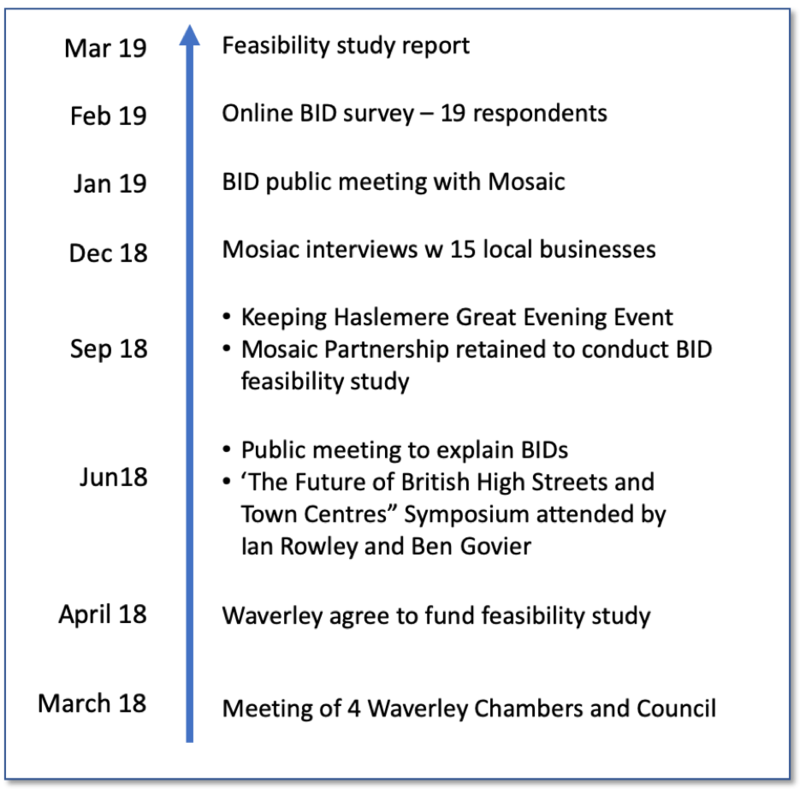 The Chamber has been working with Waverley Council and the other 3 Chambers in Waverley (Cranleigh, Godalming and Farnham) to explore the opportunity to create a Business Improvement District in each of the four towns. We will keep this page updated as the BID process progresses. Towards the bottom of the page is a basic backgrounder about BIDs – what they are and how they are set up and managed. 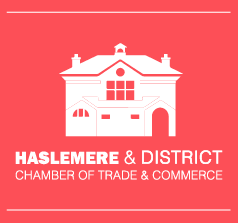 We have been working on the BID as part of our “Keeping Haslemere Alive” initiative. We know that High Streets are suffering across the UK as peoples’ shopping and leisure habits change. So our high streets need to change as well. A BID is one mechanism that might help us manage our High Streets more effectively. conducted an online survey which elicited 19 responses from across the town. The information below is extracted from Mosaic’s feasibility study report. A key part of the development of any BID is knowing what is ‘on the ground’, the type of business, the rateable value, the geographical and sector spread. If a BID is to be developed, this information will form the basis of a comprehensive market research and consultation exercise, the development of the business proposals, the balloting and the legal and financial framework upon which the BID is determined and operated. The Mosaic Partnership consequently regards this part of the study as key and we have used the following data and methods to ensure accuracy. The National Non Domestic Rates (NNDR) List was formally obtained for the study from Waverley Borough Council. It should be noted that this list ultimately forms the legal basis of any BID levy charge. This information was then compiled and fully analysed and is available to BID organisers. The information held on this database should only be used for the development of the BID proposals. The key information from this analysis is set out here. determined by what projects are required. Secondly, it is worth noting that BIDs operate independently so project costs will need to include not only content cost but also costs for its implementation e.g. employment of staff or use of contract agencies. There is also considerable pressure from those paying the levy to see a tangible difference therefore any levy raised should be sufficient to ‘move the needle’. Finally it may also prove to be prudent to make exempt from paying those with very low rateable values as administratively it may be more expensive to collect than the benefit achieved. (Those who are exempt do not have a vote). What shall we do with the money!! 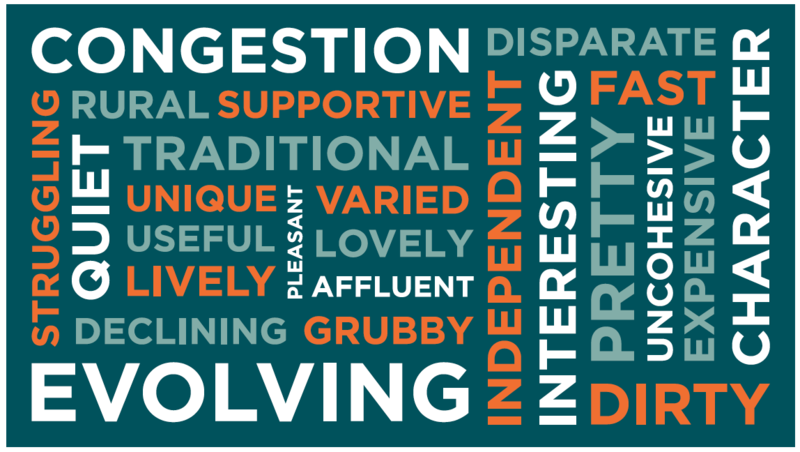 As part of the survey, respondents were asked to state 3 words to describe their town centre. The words were used to create a ‘Wordle’ which illustrates what can be celebrated and what needs to be addressed in each area. 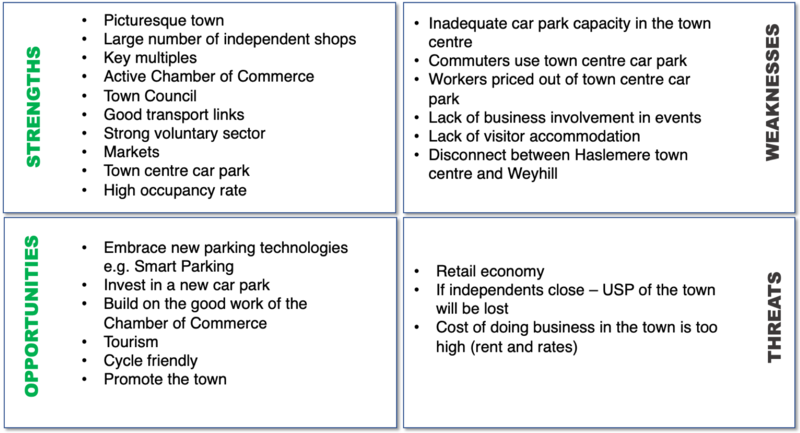 Survey respondents were are what they considered to be the Strengths, Weaknesses, Opportunities and Threats are of Haslemere. A BID is a formal mechanism which allows dedicated funds to be collected for the delivery of an agreed business plan. Usually, a group of local businesses and public sector representatives form a partnership to develop a BID. Detailed discussions with local businesses are undertaken to identify issues and concerns and from this the partnership develops a business plan detailing projects and services which will address the issues. Businesses are then asked to vote on the plan and if they vote in favour all businesses pay a levy which is ring fenced for the delivery of the BID Business Plan. The vote is a postal ballot which is sent to all business rate payers in the BID area who will pay the levy if the vote is successful. To secure a “yes” vote the proposal needs to achieve sufficient votes through two criteria. Firstly, of those voting over 50% must vote in favour and secondly those who have voted in favour must represent at least 50% of the total rateable value of those voting. An arrangement whereby businesses get together, decide what improvements they want to make, how they’re going to manage and deliver improvements and what it will cost them. This all goes into a business plan which is voted on by all those who would have to pay. The BID can last for a maximum of 5 years and must be able to demonstrate how it has benefited businesses who have funded it. Have BIDs been supported elsewhere in the UK? The legislation came in September 2004 and there have already been over 300 successful ballots including over 60 renewals. These BIDs involve over 100,000 businesses and will bring in over £300m of new finance to develop their centres over the next 5 years. What might a BID deliver? BIDs can deliver any projects or services that are agreed by the relevant businesses and are an addition to anything the Public Sector does. In most cases they focus on marketing and promotion activities, increasing safety and security for business and customers and better transport and access arrangements. The important thing is that BIDs are in the main addressing operational matters and that actual projects and services will be determined as a result of detailed consultation with all the business in the BID area. A BID is a mechanism which allows businesses to control a sum of money to manage and deliver projects which they believe will improve the trading environment for them. It should ultimately increase trade and drive down costs for those businesses that are paying for the improvements. A BID can be proposed by any business ratepayer, property owner, local authority or other key stakeholder with an interest in the BID Area. How will the BID be Managed? BIDs should be controlled and managed by local businesses that are paying the levy. The majority of BIDs are delivered through Companies Limited by Guarantee with Directors elected from the BID levy payers. The organisation delivering the BID will be responsible for the delivery of the BID projects and services and directly responsible to all it’s business membership through an elected board. BIDs can draw in other voluntary funding, e.g., from property owners, public sector and RDA’s. Does this mean the local authority will stop delivering services? BID money can only carry out projects and services which are ADDITIONAL to those that public agencies have to provide. Prior to the BID Business Plan being produced the current services being delivered by all public agencies including the Local Authority and Police are benchmarked. The Local Authority has to continue to deliver that level of service for the period of the BID. The BID company can agree to provide additional resources to deliver a higher level of service over the benchmarked level if businesses want this. Like any good business plan specific key performance indicators (KPIs) are set and performance is monitored against the KPIs by the BID board. As businesses contribute the funding to achieve those specific KPIs set out in the prospectus the BID Company will be required to monitor and inform its members of progress on a regular basis.